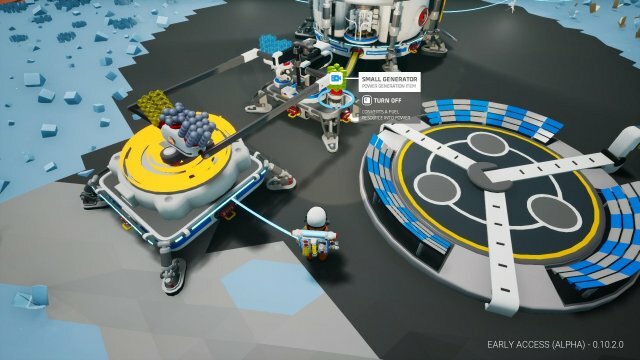 A list of components and machines as of 0.10 update The Crafting Update. How to Survive the First Day. 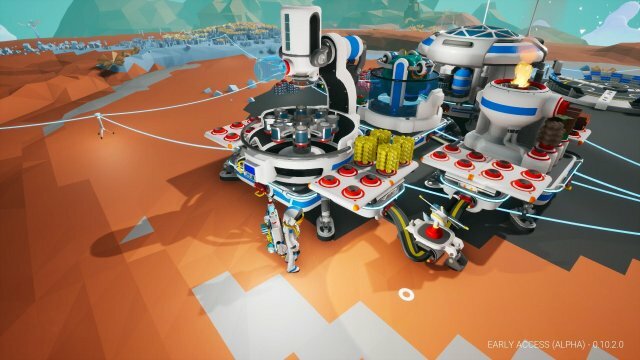 You can stick Platforms to walls, allowing storage to be out of the way from other machines. I find this particularly useful with Extra Large Storage due to its shape, you can access all sides when it's placed like so. Large Platform B has two side slots. These are good for either storing research nodes awaiting processing, or place a Medium Storage on them and it will lay flat. So, building your machines on Large Platform B and adding the Medium Storage, the items being processed on machines such as the Smelter or Centrifuge will automatically move to adjacent storage. 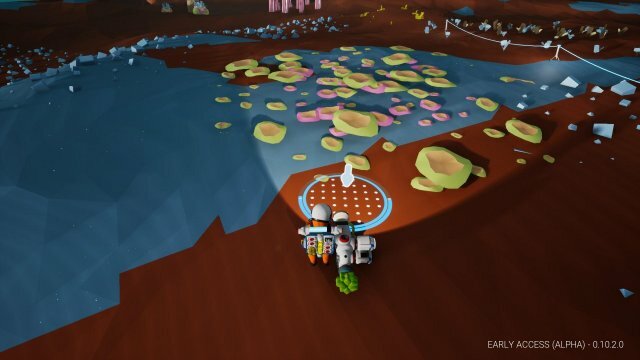 When you land and exit your drop pod, an Exo Habitat and Landing Pad will pop out and the ground will flatten, establishing your home base. Using the landing pad will get you a Starter (Medium) Platform and Medium Printer. 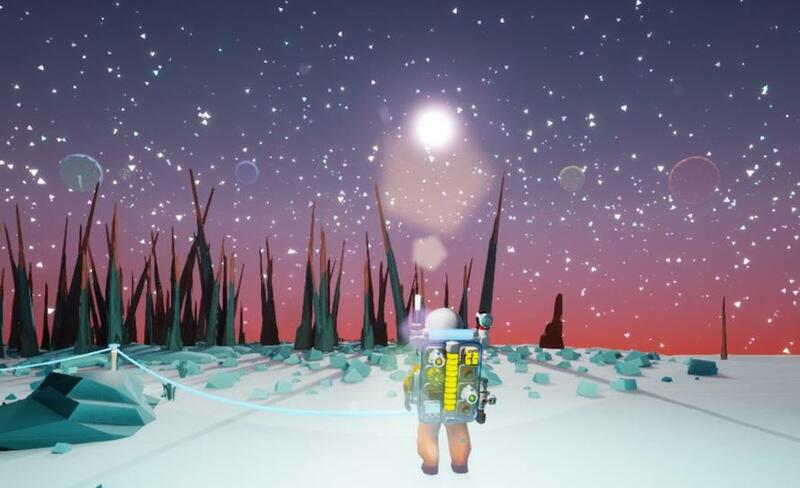 To get anywhere, you'll need to make Tethers, so you'll need Compound. 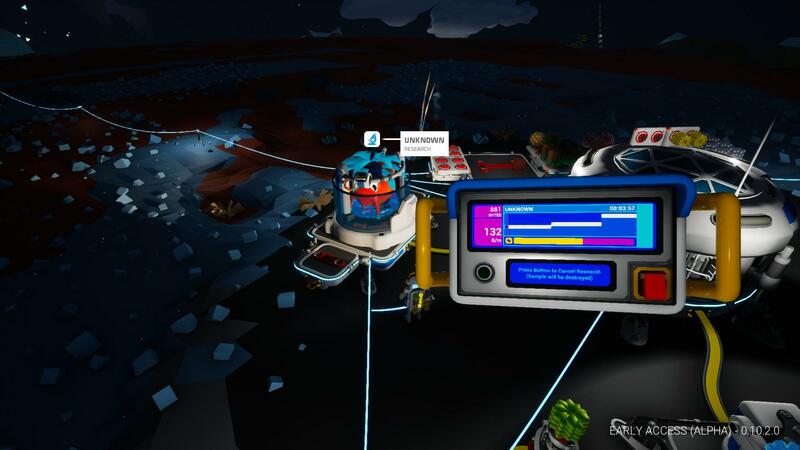 Explore around your base in a close circle, paying attention to your oxygen level. 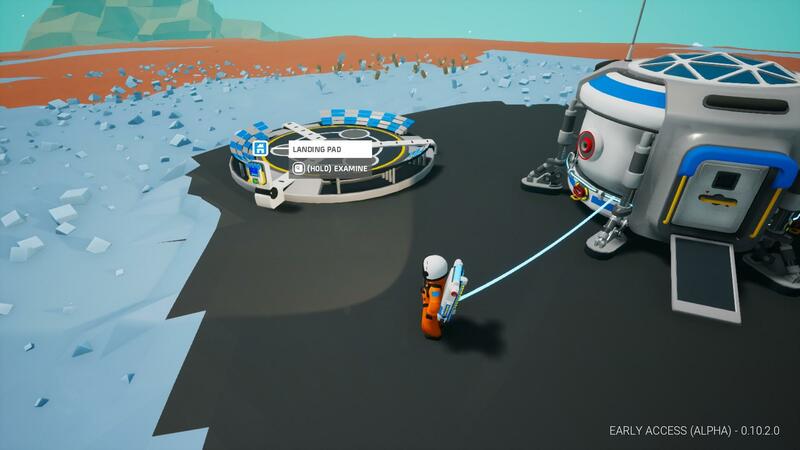 Harvest some nearby Compound and craft Tethers, now you'll be able to press "T" to create a Tether and run both power and oxygen to your Astroneer. To make the most of your Tethers, you can place one as you get out of range of the nearest one. This will maximize range. The Tethers can work through terrain, so you can use this to your advantage if you need a quick tunnel down during a storm, or not to waste them on terrain bends. 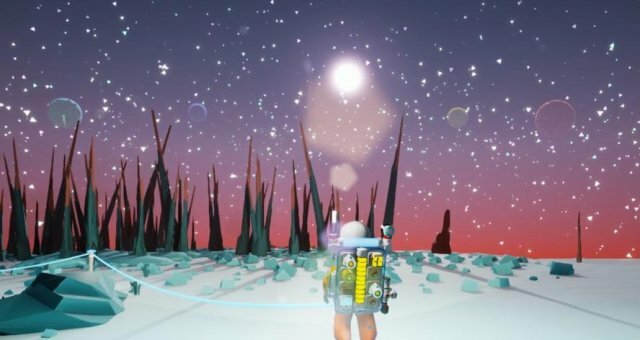 Survey the nearby area for resources, and pick a couple directions to Tether out. 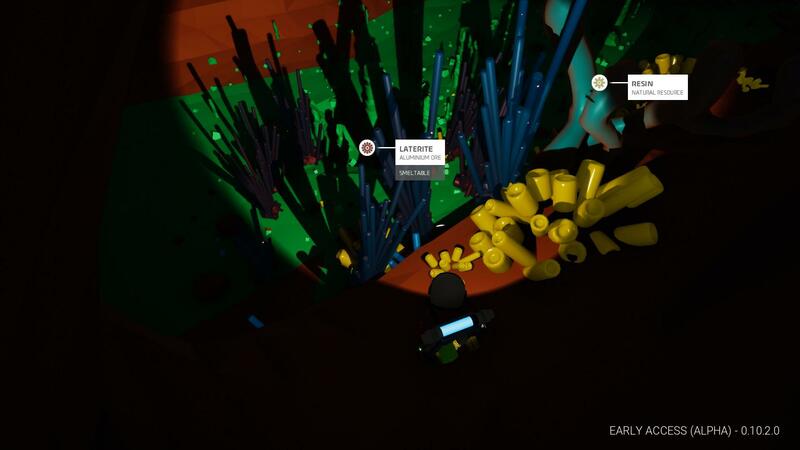 Ideally, look for a cave, as the less common resources needed later on will be found underground. 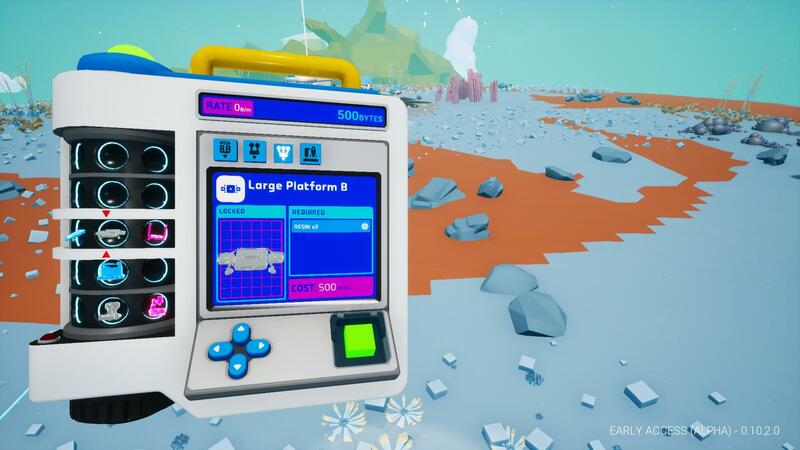 Collect lots of Resin, especially if you want to build a lot of platforms and storage to be a space hoarder like me. 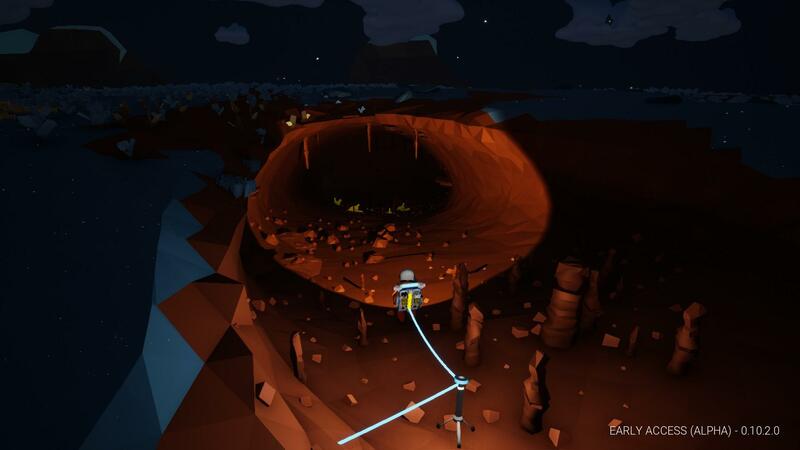 Make a Canister or two from your Astropack so that you will be able to build walls and create ramps and bridges as you explore the cave networks. 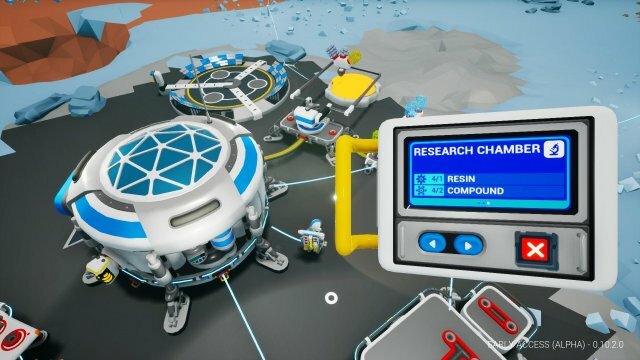 In order to research and advance, you will need to build a Research Chamber first. Gather 3 Resin and 2 Compound, then use the Medium Printer to construct a Large Platform and a Research Chamber. Get it unpacked and connected. The order in which you do research is largely up to you and what you want to focus on, but I will discuss getting towards the Large Shuttle the fastest. I also get a few "essentials" like Beacon, Work Light, Oxygen Tank before I launch off to anywhere. There are three main ways to get research. The first are small Research Samples attached to various organics and minerals around the planet. Hover your cursor over them and hold "E" to gain some research bytes. Those add up, but the greatest amount of points will come from larger 'Unknown' Research samples. There are many types to find, such as underneath hostile plants or growing from larger plantlife, attached to minerals on cave ceilings, or even at ruined bases. 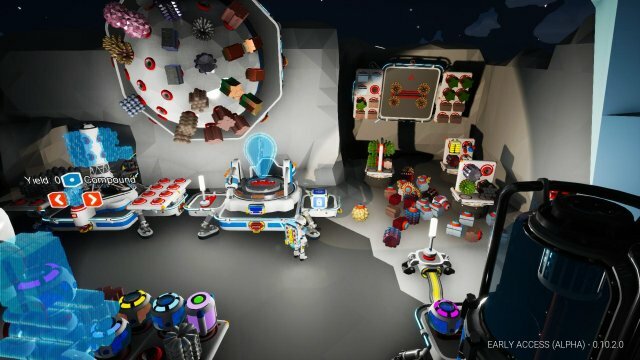 You will have to haul these back to your base for processing in the Research Chamber. Lastly, if you are lacking in Research Samples, you can process regular components like Organic, but they are not worth many points. 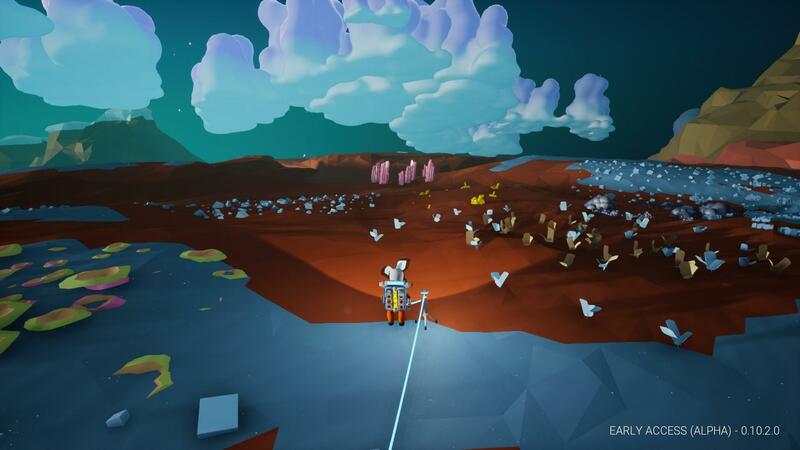 These are the essential research items needed to blast off to another planet and get new resources. I also highly reccomend Beacon, it's only 250 research bytes and placing one on the planet you go to will mark the area so you can find it again and not have to set up new outposts each time. You may also want to think about Small Solar, to help power your research and smelter better during the day and not have to gather so much organic. 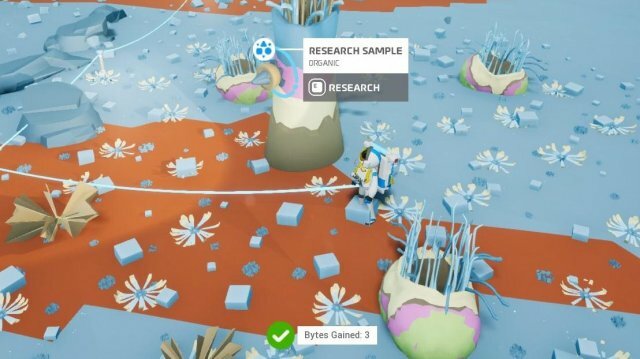 If you don't have sufficient power, it will take longer to process the research nodes you bring back. Build and run at least one Small Generator when you are actively crafting, you can shut it off by holding "E" while hovering over it. This will stop consuming the organic on it until you turn it on again. This is an example of some good organic to gather! 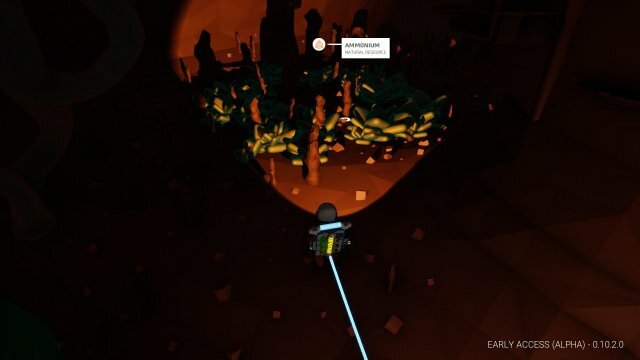 Again, find a cave to go into, and the further down you go, the more likely you will find neat stuff. 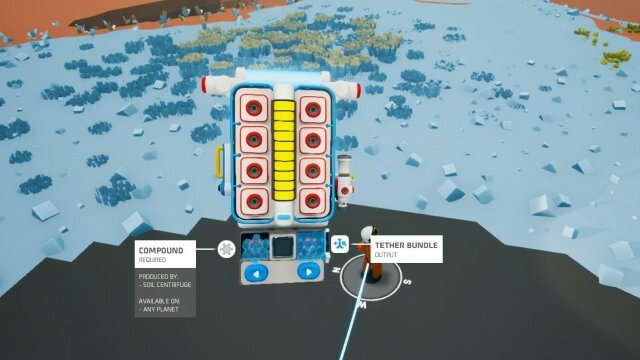 You want to gather lots of research nodes, but also pick up any Aluminum and Ammonium you find, you will need this to craft the Shuttle parts and Thruster. You will be running back and forth to your base a lot, and depending on your random generation, you can have a plethora of nodes pile up. 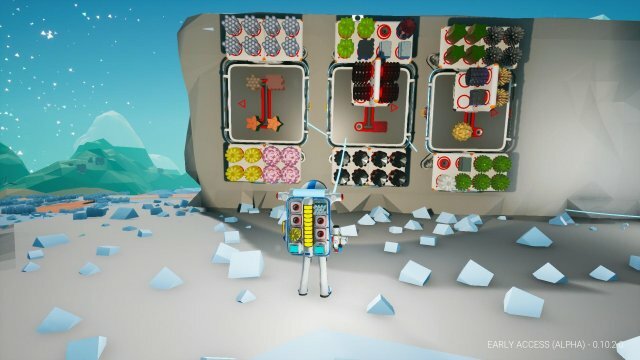 On my first main playthrough, I ended up building a second research chamber and additional power so I could speed the process along.